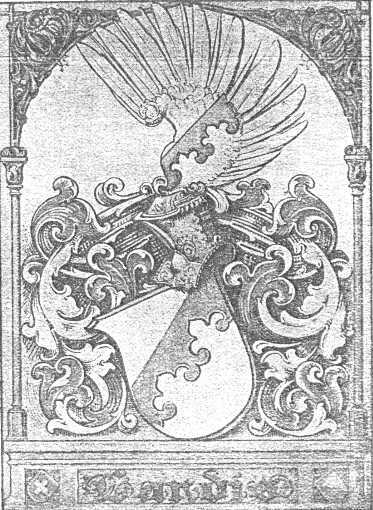 dated 3 September 1932, Perkasie Park, Perkasie, PA.
"Several years ago, when Miss Amy Du Puy was visiting the Landes (National) Museum in Zürich, Switzerland, where hundreds of old painted coats of arms can be seen, she called the director and inquired whether there was a Landis family coat of arms there, which he politely found for her in a large book of heraldry on his table. Miss Du Puy states that most of the German arms are florid, highly colored ones, but the Landis arms are very beautiful indeed, the two colors, only dark blue and gold, looking very well together. With a rude sketch which Miss Du Puy made, she states that the mantling is dark blue and gold, while other parts are solid gold and others dark blue. The Norman sheild is dark blue with gold trimming. The helmet is a strange German one. The ribbons are dark blue and gold. Miss Du Puy is a neice of the late Col. Jacob Hostetter, of Pittsburg (of Hostetter Bitters fame), whose mother was Mary Landis." "The heraldry is of a common late-15th century type. 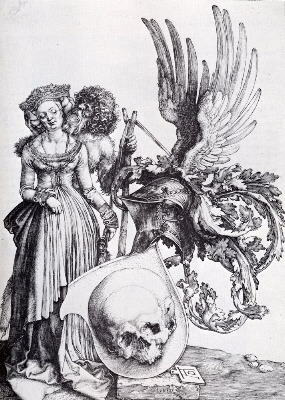 The shape of the helmet indicates that the owner was a member of the bourgeoisie ( thus not a nobleman), and that therefore his coat-of-arms had been purchased rather than inherited, and could not legally be handed down to his descendants. Such arrangements were particularly common during the reign of Kaiser Friedrich III (the father of Maximilian), who was ever short of cash, and the practice continued during Maximilian's own reign, and probably beyond. The helmet shown here is the type actually worn in tournaments with tipped lances--unlike the nobleman's "spangenhelm", which had vertical, curved bars across the face and was only useful for parading in, or for wear in the tournaments with clubs that were all the go at the Imperial court." 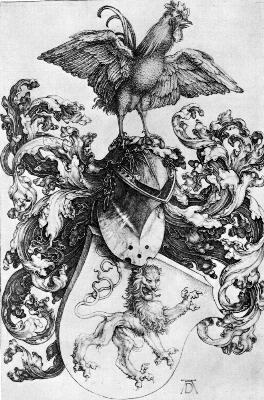 "Our curator of prints here at the Chazen suggested [the coat-of-arms above] image bears striking resemblance to a prototype by Albrecht Dürer."